Ailanpa Cafe & Wine House. Yesterday I went trekking from my base in Cauvsin to an open air museum, although I was above on the mountain of the area while all the tourists from the tourist buses were down below, from that area I hiked to another open air museum that there were very few tourists. This area was wonderful—I will post more information about this non-tourist route soon. At any rate, I hitchhiked and got a ride to Urgup. It is really easy getting a ride here in Cappadocia by using the thumb. Once I got to Urgup all I could think was Turkish Ravioli. 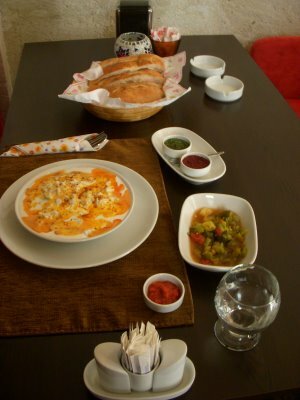 I highly recommend stopping at the Ailanpa Cafe & Wine House for some home cooked Turkish style ravioli. Emine, the mother of the family, is a wonderful, warm-hearted, person—tel. 0 384 341 69 72. 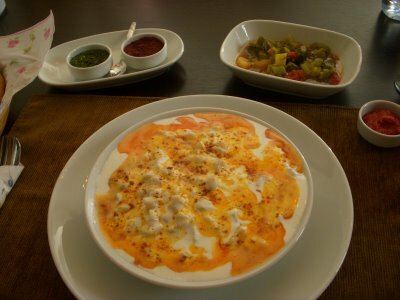 As you can see from the pictures the food is mouth watering and absolutely delicious. The music they play creates a fine atmosphere—classic blues, jazz, and soul music—just an over all nice, relaxing, dinning experience. 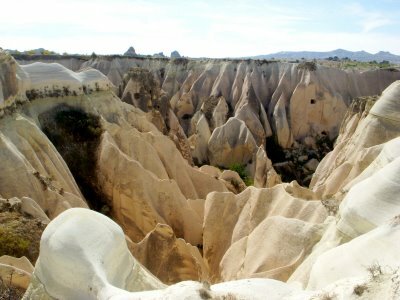 I have so many pictures of Cappadoica is it really difficult to chose which pictures to post on the blog. A picture from the Kizilcukur Valley—The sound of the flute bounces off the walls of the valley, absolutely acoustic. Previous post: The Red & Rose Valley—Cappadoica.